Barcelona forward Lionel Messi has returned to training for the first time in seven weeks as his team prepare for the season's first 'El Clasico' against Real Madrid on Saturday. Messi, 28, has been out of action with a knee injury since 26 September. 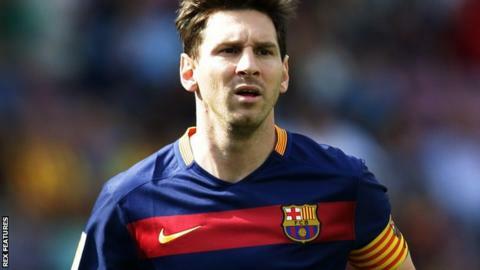 Spanish media have suggested that Messi may be named on the bench for the trip to the Bernabeu. Barcelona are top of the La Liga table, three points clear of Real and four ahead of Atletico Madrid. Neymar and Luis Suarez - the other two players in Barcelona's three-pronged attack - have made light of Messi's absence with 11 and nine goals respectively in 11 league games. Argentina international Messi also missed his nation's 1-1 draw with Brazil in World Cup qualifying on Saturday and is ruled out of Tuesday's match against Colombia. Argentina's team doctor Homero de Agostino has said Messi runs the risk of a recurrence of the injury if he makes his comeback against Real.